A integral centrifugal fan and positive pressure sensing switch specifically designed for residential dryer vent booster applications. The fan can be mounted in any angle at any point along the duct work and straight-through air flow design allows easy installation. By using FC type mounting clamps, fan can easily be removed from duct work for service. 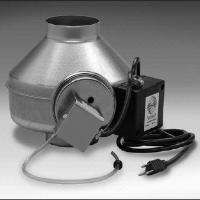 Fan inlet and outlet are 4” diameter allowing direct installation into dryer vent duct thereby eliminating the need for transition pieces. Motor bearings are a permanently sealed, self lubricating ball type. DBF4XL fan is backed by Fantech’s Five Year Warranty.